That was the New South Wales Premier, Mike Baird, speaking today on the first anniversary of the Lindt Café Siege when the Iranian refugee and gunman, Man Horan Monis, held 18 people hostage for 17 hours – a siege that ended in the deaths of café manager, Tori Johnson, and a regular customer and well-known barrister, Katrina Dawson. It brought home on a perfect Christmas shopping day how close we are to terrorism, whether by a lone wolf, as alleged in the case of Monis, or by a 15-year-old boy who killed NSW police accountant Curtis Cheng outside Parramatta police headquarters in October. The boy, shot and killed by police at the scene, was allegedly mentored by four males, aged between 16 and 22, linked to the clerk’s shooting. Today, the Sydney Morning Herald said in an editorial, questions lingered on a year after the siege: “… debate rages as to whether Monis was a terrorist or a mentally ill criminal with a vendetta against the justice system dating back to a long running battle in the Family Court. What is important is how someone likely to commit violent acts masked as terrorism or open to incitement to criminal acts under the direction of extremists was able to carry them out in the midst of Sydney’s bustling financial district. Since the Martin Place siege a 15-year-old boy under the influence of Islamist extremists has killed a police clerk … a number of Islamic State sympathisers have been arrested across Sydney. Australians have been involved in IS operations in the Middle East.” Tonight,Sydneysiders will attend a public ceremony at Martin Place to mark the anniversary and remember the victims as images of the myriad floral tributes left at the site last year will be projected on the café windows, along with the countless notes and messages (Top of page: Family and friends of Tori Johnson pause to read messages of support at the site in 2014. Photo by Adam Taylor News Corp Australia). And I will remember Paris from only a month ago. Ever since the terror attacks on the City of Light on a Friday night in the middle of November, I have been trying to work out what to say on my blog about a Paris I haven’t visited for more than 40 years but still love. It’s not that I’m hoping to be profound, although that would be nice, but just to give readers something different to think about. Finally, I found it – empathy, a word often used on this blog. Putting yourself in the shoes of the innocent victims in those horrible Islamic State murders, with the executioners gunning them down one by one in the Bataclan theatre. 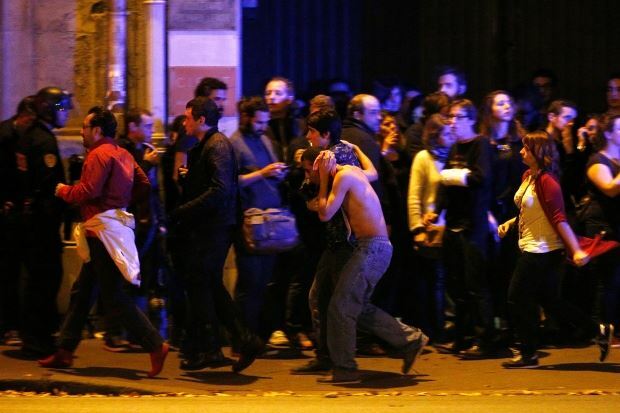 (Wounded being evacuated from Bataclan. Photo below: Yoan Valat/EPA) Nineteen-year-old Emma Parkinson from Tasmania, who was shot through the thigh, summed it up on 60 Minutes: “They were … laughing and being happy and doing what young people do.” She also took a shot back at the terrorists: “The only reason why you would want to target that specific demographic would be to incite hate and to incite fear and to try and make people afraid.” They were aiming at the Charlie Hebdo generation – the youths who shouted or carried signs saying: “Je suis Charlie,” after the attack on the magazine which dared to mock Muhammed. Then there were the police and security services who had to deal with a well-organised group of terrorists, capable of launching several attacks at the same time, using bullets, bombs of the suicide kind, and mobile shootings of the drive-by kind. The law enforcers were scared, too. Hardest of all to empathise with, would be the Islamic extremists, who screamed Allahu Akbar as they calmly killed people they had never met. But we have to empathise to a certain degree, otherwise, we will never defeat them. And there were many times that weekend where I found myself fantasising about shooting down a jihadist, even though I never pulled a trigger on a real gun in my life. What would I say to an extremist before he or she killed me? “I suppose a beer would be out of the question,” surely wouldn’t work, and I certainly couldn’t quote a text from the Koran. I’m guessing I’d be one of the first to go. Then, more food for thought. 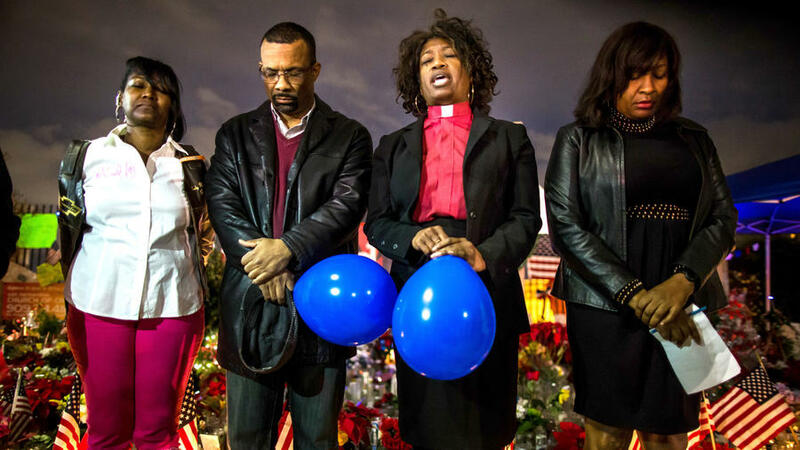 Out of the blue came another terrorist attack, this time in the relatively affluent city of San Bernardino, only kilometres from Los Angeles, at a Christmas party for county health workers. Syed Farook, 28, a county environment health inspector, and his wife, Tashfeen Malik, killed 14 people and wounded 21, at the holiday lunch. Farook was a US citizen, who was born in Chicago, while his wife was a Pakistani, who pledged allegiance to Islamic State on Facebook on the day of the massacre. The FBI says they had both been radicalised before they met and married, and had been planning it for some time. The terrorist couple were said to be living the American dream in Redlands, with their six-month-old daughter, and his mother living with them. They dropped the baby off with his grandmother before going on their killing spree. They also managed to secure at $38,000 loan and take target practice to get ready for their suicide mission. They died in a shootout with police. This is when Republican presidential candidate Donald Trump got involved. He called for a ban on all Muslims from entering the US, comparing his proposal with President Franklin D Roosevelt placing Japanese in US internment camps after the bombing of Pearl Harbor. Trump unleashed criticism from prominent Republicans like House Speaker Paul Ryan and Senate Majority Leader Mitch McConnell, but they said they would support whoever won the nomination. Trump didn’t stop there, suggesting some areas of London were “no-go” because they’d been radicalised. The ever effervescent Mayor of London Boris Johnson couldn’t resist having a go at the presidential candidate: “… I have to say when Donald Trump says that there are parts of London that are no-go areas, I think he’s betraying a quite stupifying ignorance that makes him frankly unfit to hold the office of president of the United States. I would invite him to come and see the whole of London and take him around the city except that I wouldn’t want to expose Londoners to any unnecessary risk of meeting Donald Trump.” Donald Trump got into a war of words with another mayor, this time, Michael Nutter of Philadelphia, where politicians speak plainly, sometimes too plainly. Mayor Nutter, who is not really a “nutter,” described Trump as an “as_hole,” at a press conference, which included members of the clergy. He later apologised to the clergy. Trump responded, calling him a “low life,” tweeting he was a “crude dope.” I must admit it’s difficult to empathise with Donald Trump, but a lot of Republicans seem to have no problem doing just that. 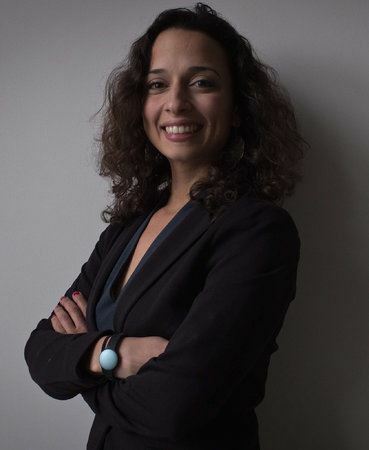 Daily News Columnist Ronnie Polaneczky points out Yasmine’s anxiety has spread around the world, with hate crimes against Muslims increasing threefold in the United Kingdom alone following the Paris attacks, according to Tell MAMA (Measuring Anti-Muslim Attacks), a UK non-governmental organisation. Anti-Muslim sentiment is already five times higher in the US than it was before the attacks of 9/11. And Yasmine and her family have experienced racism since the planes flew into the Twin Towers. She tells the story about how the day after the bombings, her boss asked her: “You don’t know how to fly a plane, do you?” She was fired a few days later. Now aged 33, she runs her own start-up company in West Philly, ROAR for Good, producing safety jewelry that emits alarms, aimed at reducing assaults. With pre-sales going well, she plans to ship the pendant/pin called Athena to buyers in 47 countries in the northern spring. Safer and better even for those who hate Muslims. We can but hope, Yasmine. The problem is how to handle those terrorists who empathise with groups like ISIS and kill innocent people in the name of Allah. I’m not sure what the solution is. But I doubt that allowing people to buy guns for home protection is a good idea. The Los Angeles Times reports: Following the mass shootings in Charleston, South Carolina, Chattanooga, Tennessee and Roseburg, Oregon, so-called Black Friday, the day after Thanksgiving on November 27, was the busiest single day for gun dealers since at least 1998. That was the same day a gunman killed three people including a policeman at a Planned Parenthood clinic in Colorado Springs. From a military point of view, the Paris attacks led French President Francois Hollande to declare a “pitiless war against the Islamic State,” and Russia to start supplying weapons and air cover to the opposition Free Syrian Army. While Australian counterinsurgency expert, David Kilcullen, applauds the cooperation by Europe, Russia, the US, Australia and other Western nations, he made this warning in the Weekend Australian of November 21-22: “Clearly Islamic State is far from contained. And given the atomised highly connected nature of the threat – and the possible emergence of low-grade urban guerilla warfare in Europe – it may be worth asking whether containment already may be overtaken by events. Urban guerilla warfare, indeed, could be coming soon to a city near you.” What can we do in Australia if urban guerilla warfare is coming to city near us? Stay calm, hope that Australian officials make rigorous checks of refugees coming here, and keep an eye on anything suspicious in your neighbourhood. I never thought I’d write that, but I’ve been thinking about it since the Lindt café siege in Sydney a year ago which left two innocents dead. Let that be a warning to all of us.